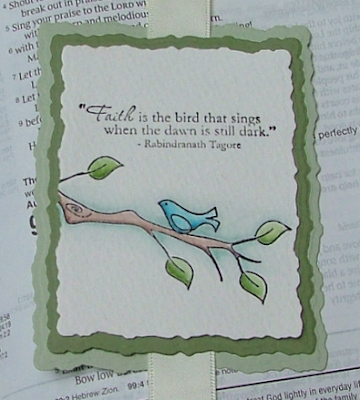 As soon as I saw the new Faith & Hope set, I knew I wanted to make my daughter a bookmark for her Bible. 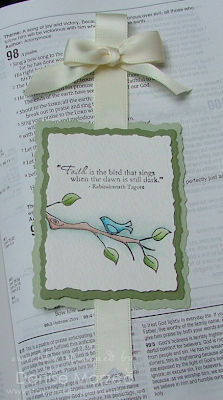 I paired the sentiment from the Faith & Hope set with the branch and bird from Branching Out as well as some of Taylor's gorgeous Ivory Satin Ribbon. The main panel was stamped in black craft ink and then heat embossed with clear embossing powder. You can also get the Spellbinders Deckled Rectangles and the Prism Herbal Garden Medium CS in the TE Store. REALLY pretty! LOVE the soft greens and ivory. How beautiful! 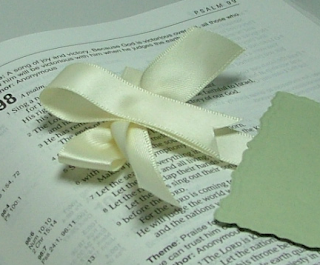 And what a perfect bookmark for a girl's bible! So beautiful Denise!!! Perfect bookmark!!! Beauiful Denise! Love the soft colours you chose and your colouring is perfect again! This is such a precious and loving handmade gift to your DD Denise!! SO sweet! Beautiful how you did the ribbon!!! You are just the awesomest!! This is BEAUTIFUL Denise! LOVE LOVE LOVE this! !